The 92nd annual PA State Farm Show was held at the Farm Show Complex and Expo Center, Harrisburg, PA. Judge Cody Lauderman, Macomb, IL, evaluated 130 females, 23 bulls and one cow-calf pair. Reigning in the top spot as Supreme Champion over all beef breeds and Grand Champion Bull was Rains Grid Dream, a March 2006 son of TC Grid Topper 355 for Rains Angus, Mercer. He was first named junior champion bull. Reserve Grand Champion bull was owned by Hannah Grim, East Berlin, with BCA Hollister H71, an April 2007 son of TC Stout 407. He was first named junior bull calf champion. Claiming the top female spot was Kurt Long, Airville, with LVA GRF Ginger 605, a May 2005 daughter of Champion Hill Edition 2029. She first claimed the intermediate champion. The reserve grand champion female was shown by Katrina Frey, Quarryville, with Freys KJF Ark Pride K32-R36, a February 2006 daughter of WCC Special Design L309. She was first named the Junior Champion female. Grand Champion cow-calf was shown by Just Enuff Angus, Bethlehem, with Just Enuff Widespread Mercedes, a five year old by Whitestone Widespread MB with a heifer calf at side by EXAR Lutton 1831 calved October 2007. 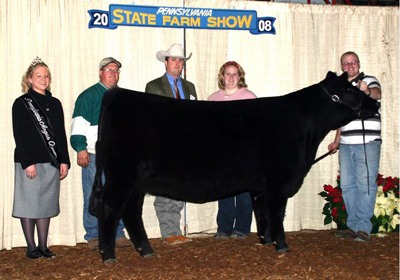 The junior heifer calf champion was shown by Lacey Murray, Garret, with Sherwood Rosebud 757T, a March 2007daughter of Champion Hill Fullback 380. the reserve junior heifer calf champion was shown by Alysha Sweitzer, Wellsville, with BCA Scaara Networth K714, a March 2007 daughter of SAV Networth 4200. The Senior Heifer calf champion was shown by Ryan Nolt, New Holland, with Triple N Dakota Misty, an October 2006 daughter of G13 Structure. The reserve senior calf champion was shown by Michelle Landis, Northampton, PA, with Langus JEA Katinka 621, a December 2006 daughter of SAV 8180 Traveler 004. The intermediate champion was the grand champion female for Kurt Long, the reserve intermediate champion was shown by Hannah Grim, East Berlin, with BCA Black N Fancy K612, a May 2006 daugther of TC Freedom 104. The junior champion female was the reserve grand champion for Katrina Frey, Quarryville, and the reserve junior champion female was the April 2006 daughter of Northern Improvement 4480GF for Dylan Fessler, Robesonia. The senior champion female was Freys KJF Delia M90-R04 for Katrina Frey, Quarryville, a December 2005 daughter of SAF Connection. The junior bull calf champion was the reserve grand champion for Hannah Grim, East Berlin. The reserve junior bull calf champion was the March 2007 son of BT Crossover 758N for Rains Angus, Mercer. 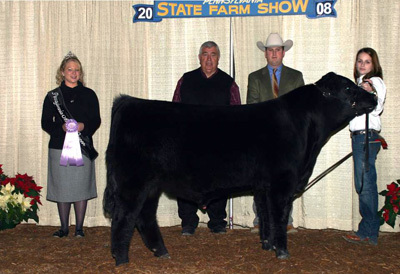 The senior bull calf champion was shown by Cedar View Farm, Greencastle, PA with Sarge of Cedar View, a September 2006 son of Whitestone Frontier R209. the reserve senior bull calf champion was shown by Katrina Frey, Quarryville, with Freys Prince Xtra Stout, a September 2006 son of WCC Xtra Stout N7. the junior champion bull was the Supreme Champion shown by Rains Angus, Mercer. The reserve junior champion bull was shown by Amanda Thompson, Wellsville, with Cedar Hill North Star 216, a February 2006 son of Northern Improvement 4480 GF. Angus Get of Sire was shown by Katrina Frey, with the get of Freys Cavalier. The junior get of sire was shown by Beaver Creek Angus, East Berlin, on the get of TC Stout 407. Angus breeder six head was shown by Rains Angus, Mercer. 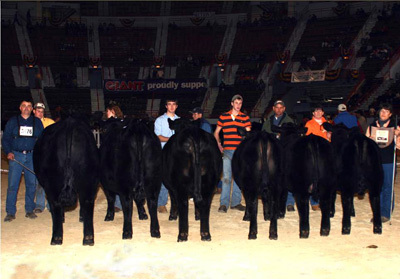 Premier Breeder and Premier Exhibitor was shown by Beaver Creek Angus, East Berlin, PA. Rains Grid Dream GTNI722 won grand champion bull at the 2008 Pennsylvania Farm Show's Angus Show, January 7 in Harrisburg, Pa. Dale Rains, Mercer, Pa., owns the March 2006 son of TC Grid Topper 355. He earlier won junior champion. Cody Lowderman, Macomb, Ill., evaluated the 151 entries. Photo by American Angus Association. 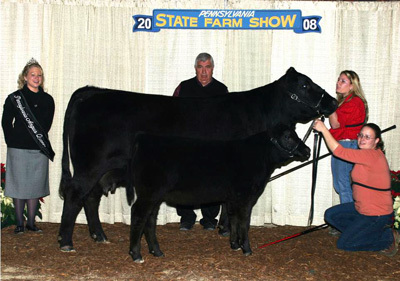 B C A Hostel H71 won reserve grand champion bull at the 2008 Pennsylvania Farm Show's Angus Show, January 7 in Harrisburg, Pa. Hannah Grim, East Berlin, Pa., owns the April 2007 son of TC Stout 407. He first won junior calf champion. Cody Lowderman, Macomb, Ill., evaluated the 151 entries. Photo by American Angus Association. 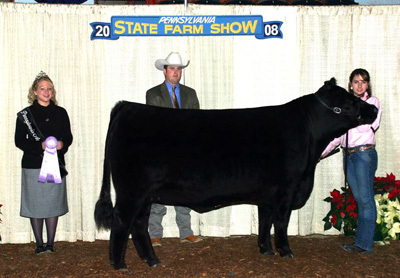 LVA GRF Ginger 605 won grand champion female at the 2008 Pennsylvania Farm Show's Angus Show, January 7 in Harrisburg, Pa. Kurt Long, Airville, Pa., owns the May 2006 daughter of Champion Hill Edition 2029. She earlier won intermediate champion. Cody Lowderman, Macomb, Ill., evaluated the 151 entries. Photo by American Angus Association. Freys KJF Ark Pride K32-R36 won reserve grand champion female at the 2008 Pennsylvania Farm Show's Angus Show, January 7 in Harrisburg, Pa. Katrina Frey, Quarryville, Pa., owns the February 2006 daughter of W C C Special Design L309. She first won junior champion. Cody Lowderman, Macomb, Ill., evaluated the 151 entries. Photo by American Angus Association. Just Enuf Widespred Mercedes won grand champion cow-calf pair at the 2008 Pennsylvania Farm Show's Angus Show, January 7 in Harrisburg, Pa. Jennifer Hower, Bethlehem, Pa., owns the April 2002 daughter of Whitestone Widespread MB. A September 2007 heifer calf sired by O C C Legend 616L is at side. Cody Lowderman, Macomb, Ill., evaluated the 151 entries. Photo by American Angus Association. Dale Rains, Mercer, Penn., won breeders' best six head at the 2008 Pennsylvania Farm Show's Angus Show, January 7 in Harrisburg, Pa. Photo by American Angus Association. 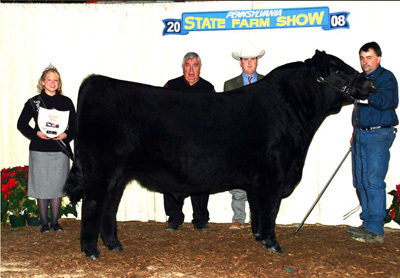 The progeny of TC Stout 407 won junior get-of-sire at the 2008 Pennsylvania Farm Show's Angus Show, January 7 in Harrisburg, Pa. Beaver Creek Angus, East Berlin, Pa., owns the winning trio. Photo by American Angus Association. 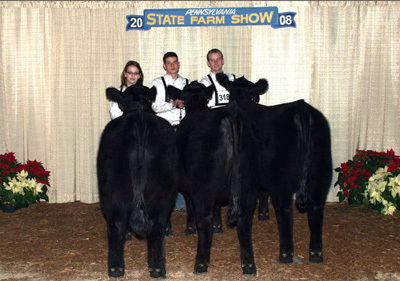 Beaver Creek Angus, East Berlin, Pa., won premier breeder and exhibitor at the 2008 Pennsylvania Farm Show's Angus Show, January 7 in Harrisburg, Pa. Pictured from left includes Denton, Hannah and Kyle Grim, all of East Berlin, Pa. Photo by American Angus Association.